How Do Bloomfielders Cross the Road? Among Bloomfield neighbors, navigating the Bloomfield Bridge/Liberty Ave/Main St/Howley St. intersection is often a daily risk, one that involves extreme vigilance and caution if moving through on foot or by bike. 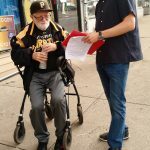 Bloomfield Development and Bloomfield Livable Streets together designed and distributed a survey to 780 respondents throughout the month of October to better understand the concerns and issues that residents have with the intersection. The data and comments gathered will help start and continue a dialogue on how to improve safety for all users at this crossroads. 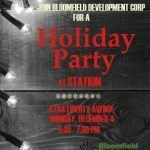 BDC Holiday Party: Dec. 4th at Station! Celebrate another successful year with Bloomfield Development Corporation! This 3rd annual fundraiser highlights BDC’s many accomplishments over 2017, our thriving business district, and engaged residents, with all event proceeds benefiting BDC. Tickets include a free beverage and a variety of hors d’oeurves. Event will also include a fun raffle with fantastic prizes. Tickets: $25 | Buy now! 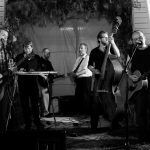 All proceeds directly support BDC’s operations. Join your neighbors for a “block party” style community picnic that celebrates Bloomfield! We’re taking it back to the basics with a stripped down, family-friendly, potluck to meet and celebrate the neighbors and business owners that make Bloomfield an amazing place to live. Join your neighbors from 3-6pm on Satruday, July 22, for a community event that celebrates Bloomfield! We’re taking it back to the basics with a stripped down, family-friendly, potluck-style picnic to meet and celebrate the neighbors and business owners that make Bloomfield an amazing place to live.